Three weeks into 2017 and it looks like the title of sexiest convertible has already been won. A few months back , the redesigned and renamed version of the Vanquish. 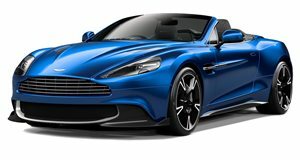 Now the English automaker has revealed the drop-top version, the Vanquish S Volante. Like its coupe counterpart the Vanquish Volante S perfectly toes the line between aggressive and elegant. Its carbon fiber aero bits tip its performance potential; the convertible gets the same engine as the hard top, a 6.0-liter V12 making 580 horsepower and 465 lb-ft of torque mated to an eight-speed automatic transmission. Performance figures will likely drop a hair from the Vanquish S’ 0-60 mph time of 3.5 seconds and its top speed of 201 mph. The elegant aspect is visible in the bodywork and more pronounced in the cabin. Aston Martin only provided a top-down view of the interior but we can clearly see the “Filograph” quilted leather seats and Satin Chopped Carbon Fiber center stack. The Vanquish S Volante the automaker showed off featured the brand’s amazing 20-inch wheels, a favorite around these parts because they give a full view of the beefy drilled brake rotors behind them. Oftentimes a bit of beauty is lost when a convertible becomes a hardtop. That’s not the case whatsoever here. In fact, it seems like the Volante may be the Vanquish S to buy. It carries a small premium over the hardtop, with saying it’ll be priced at $315,775 and hit dealerships this April. 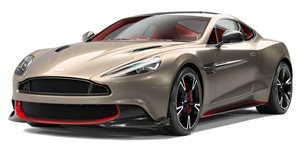 The Vanquish S coupe has a starting price of $294,950 and deliveries have already began. The new DB11 has been hogging the spotlight the past few months, and with good reason. The Vanquish S and Vanquish S Volante are proof that the “older” Astons still have something to offer.